In her sister's apartment in Chechnya, Natasha stumbles across "The Medical Dictionary of the Union of Soviet Physicians." Her sister, Sonja, is a brilliant doctor who studied medicine in London but has returned to her homeland, despite the constant turmoil of war. Perusing the pages, Natasha eventually stops on the definition of "life": "[A] constellation of vital phenomena— organization, irritability, movement, growth, reproduction, adaptation." 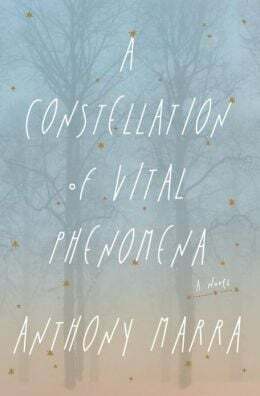 Anthony Marra's debut novel takes its title from that definition and attempts to flesh out all aspects of "life" as defined in the surprisingly poetic Soviet dictionary. "Constellation" is mostly set in the Chechnyan village of Eldár during the 1990s and 2000s, amid constant strife from the rebels and the state security forces. Akhmed, an out-of-work small-town doctor who wishes he could be a portraitist, saves Havaa, a young girl whose father, Dokka, was kidnapped mysteriously by the authorities. Havaa's and Akhmed's lives intersect with Natasha and Sonja when Akhmed leaves the girl in the only safe place he knows: the local, dilapidated Hospital No. 6, where the precocious Sonja -- all other doctors having absconded -- is effectively in charge. Akhmed cleans the laundry and assists in amputations. Moving back and forth through the 1990s and 2000s, Marra slowly assembles the tragic puzzle of how these characters are linked together in far greater ways than they ever realize. Tension builds a little too slowly, but the elegant, stomach-dropping, emotional conclusion -- to say more would dull its sharpness -- is one of the most satisfying I've recently read. Throughout, Marra's writing rarely falters. Most often it is superb: "Pigeons missing eyes and wings hobbled on the granite stone like portents of a war still years away." A few sections were likely self-contained short stories before they became part of this novel -- such as the long back story of Ramzan, who was tortured into informing on his fellow villagers -- but more memorable than the redundancies those sections contain are the book's vivid images, such as when Ramzan "measured the cold by the length of his breath, which grew and vanished, like a tusk that kept dissolving from his face." Although this is his first novel, Marra boasts an impressive resume, including a Whiting Writers' Award, a Pushcart Prize and an MFA from the prestigious Iowa Writers' Workshop. At one point, the young Havaa asks Sonja how one goes about finding missing people, like Havaa's father. "I don't know, Havaa," Sonja replies. "I don't. Maybe we try to find them in other people. In kindness and generosity; those things don't disappear." There are many tragic disappearances in "Constellation," including Sonja's own sister, Natasha. But there also is a lingering hope that we can define life, in all its forms, to contain some good things that will always last.